One of the Iraq War’s hardest hit units, which lost 22 Marines and a corpsman on a single deployment, is being commemorated by a temporary exhibit at the National Museum of the Marine Corps in Triangle, Va. The exhibit, which commemorates the dead of Columbus, Ohio-based Lima Company, 3rd Battalion, 25th Marines — known as “Lucky Lima” when it deployed to Iraq in 2005 — will be open to the public from Feb. 20 through March 3. It consists of oil paintings of each of the 23 casualties created by Columbus-based artist Anita Miller. Together they comprise a touring exhibit called The Eyes of Freedom. Each painting is accompanied by the Marines’ names, basic biographical information, a candle for each, boots and space for visitors to leave mementos, according to a museum press release. 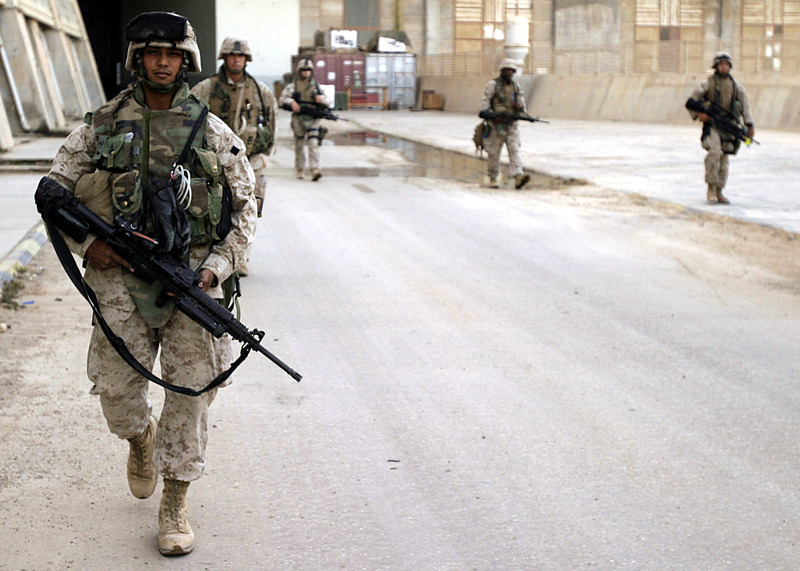 The unit suffered a staggering string of deaths while operating near Haditha, Iraq. Its Marines went miraculously unscathed for the first few months of their deployment, but the unit suffered its first of many casualties when two Marines were killed on May 8 of that year by enemy fire. By the end of the month, seven more were dead. In July two more Marines and a Corpsman were killed in action. But the unit’s darkest day came on Aug. 3 when 11 Marines riding in an amphibious assault vehicle were killed in a roadside bomb attack. When Lima returned to Ohio in October of 2005, the unit was greeted by a 20-mile parade route of cheering supporters. Wow what a great unit to be part of. The total KIA for that deployment was 48 with over 200 WIA for the whole battalion task force. My son, Cpl. David’Bear’Stewart was KIA on August 3, 2005 with the Marines of Lima. It is a beautiful exibit. Wish I could see it at the Marine Corps Museum. Yes it was very hard to first year the news of the first deaths. It woke us up! We did our best to do what Marines do. I was a machine gunner on the river known as small craft company. I volunteered for that deployment as well as the next when I hit 3 ROAD SIDE BOMBS. THANKS TO THE VA! HELP US VETERANS! My son was with 3/25 not Lima though and he lost his life on August 1st. I think he and the others not specifically with Lima that lost their lives that year should have been honored also. What a Great Honor for these Marines and there unit Semper Fi. God Speed. I am a.Retired Marine 72-93 I am happy to see these Marines and there unit be honored in this way..America has soon forgot the blood they left in Iraq maybe this is a way We Shall Never Forget what they did and how they died. Gunny Ret..
25 here. We took 16 KIA and over 100 WIA in just one deployment in 2004 Ramadi, Iraq. In a single Company. My life will never be the same, but I Thank God Daily. My Faith kept me alive and nothing else. I should have Died numerous times but with my Guardian Angle probably Arch Angel Michael himself… I made it home to my Family. I’m not trying to take away from my fellow Brothers in Arms, Semper-Fi to my Lord. After watching and listening and reading all of the above comments I can only say Semper-Fi and peace be with all of the families and loved ones of all of the above mentioned lost heroes. My son is in the Marines and has been in these areas over the past 17 years. He is still in and serving so I like to keep up with Marine news. I am blessed to still have him. I pray for you loss and deep hurt. May God Bless You all! Freedom Is Not Free! God bless the United States Marine Corps. WIA 693 (the latter reflects multiple separate incidents for individual Marines, not 693 Marines). Grant… I hope you are in a better place. You are all my HERO’S. Steve Hooper, you know that. I pray for the families of the HERO’S we lost! I served as the Marine journalist (combat correspondent) with 3/25 during this deployment. Glad to see my guys are getting some love and were not forgotten. Semper Fi! A very hard deployment, but a life changing experience and one I am grateful to have experienced. I served as a Corpsman in the Haditha BAS and later as a line Corpsman with India Company 3/25. You guys are all the best and I love every one of you to this day. I will always remember this day – I’m so indebted to each of you who gave the supreme sacrifice. God bless you all who paid the price – to families, friends, and especially to those fallen warriors – my heartfelt gratitude. My son went to Great Lakes with Travis Youngblood – the Corpsman who was killed in July 2005. Thank YOU – God Bless each and every one of you. I will always remember and appreciate you all!